competition for scarce resources. To emphasize that conflict is neither good nor bad per se is important. 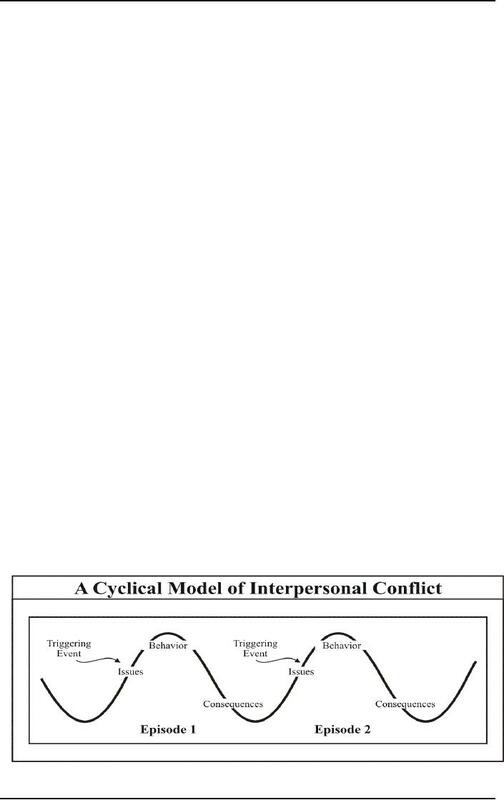 which conflict significantly disrupts necessary task interactions and work relationships among members. Third-party intervention varies considerably depending on the kind of issues underlying the conflict. suppliers and the company or between a company and a public policy agency. members resolve interpersonal conflicts that invariably arise during process consultation and team building. should they. Many times, interpersonal conflicts are not severe or disruptive enough to warrant attention. input from the conflicting parties. something triggers the conflict, making it overt, and so the cycle continues with the next conflict episode. a control strategy, however, this method may help to achieve a temporary cooling-off period. straightforward, although it is often the most difficult to achieve." and productive levels of tension and stress. gathering of data, usually through preliminary interviewing. Group-process observations can also be used. to work together to resolve the conflict. those who should attend the meeting are all elements of this context. In addition, the third-party consultant must decide on an appropriate role to assume in resolving conflict. to use a number of different intervention strategies and tactics when intervention appears to be useful. parties as neutral or unbiased regarding the issues and outcomes of the conflict resolution. description fit with the process described above? What would you have done differently? management style where communication traveled vertically through the hierarchy. expertise that would help in bringing Dan's ideas online. prior conflicts had been swept under the carpet, creating a considerable amount of pent-up animosity. development and maintenance tasks that allowed for considerable preplanning and scheduling of resources. advance notice regarding the experimental team's needs for equipment and other resources. met with Pete and Dan at the same time and, as a result, the messages she sent to each were inconsistent. stayed on, but staff at all levels of the organization were upset that his behavior had not been questioned.